Enjoy the calm and experience a more relaxing sleep in a minimalist bedroom. 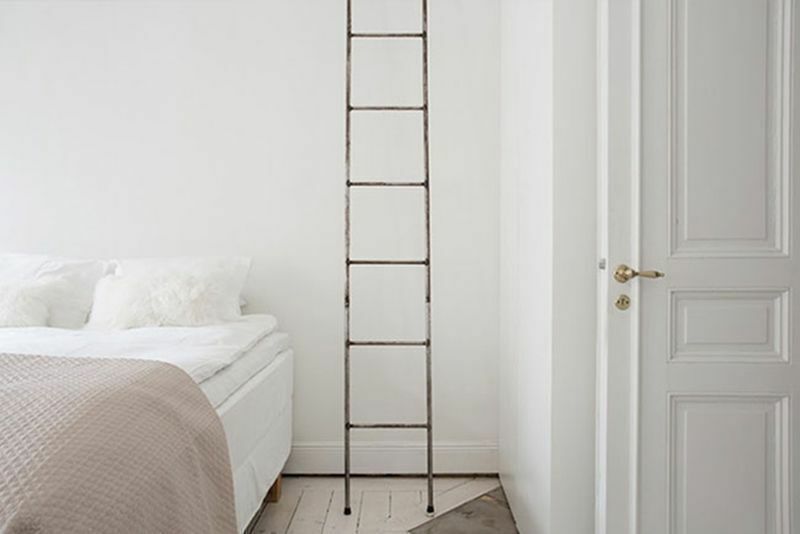 There are many benefits to turning your bedroom into a minimalist space. The absence of clutter immediately proffers a feeling of calm, invites you to enjoy a more peaceful slumber. Francine Jay, author of The Joy of Less, A Minimalist Living Guide, explains: "Becoming minimalists puts us in control of our stuff. We reclaim our space, and restore function and potential to our homes. We remake our houses into open, airy, receptive containers for the substance of our lives. We declare independence from the tyranny of clutter. It’s positively liberating." Soak up inspiration from these spaces below, and enjoy the benefits of having a minimalist bedroom soon. 1. Tiara by Momo + Partners. Keeping things minimal gives you the license to display one show-stopping furniture or home decorative piece. This bedroom, for example, aims for a touch of contemporary glam courtesy of the stunning chandelier. An opaque partial divider also adds visual interest and serves as a divider between the sleeping area and wardrobe. 2. The Regency by Rezt & Relax Interior. As traditional beds usually sport design touches that go against the minimalist look, a platform bed becomes an easy choice for a minimalist-style bedroom. In this space, a platform bed stands as the centerpiece, and is made more practical with the annexed bookshelf and hidden storage areas. 3. Phoenix Rise by X'clusiv Interior. This bedroom also makes use of a platform bed to eliminate distractions and keep the look simple. Floor-to-ceiling panes of glass and warm wood provide the space with a warm and Zen feel. 4. Bishan Apartment by Oblique Interiors. A platform bed, a calming neutral palette, and absence of bulky furniture and accessories create a soothing, minimalist space. 5. Blk 452B Sengkang West Way by Add Space Design. Remove clutter in the bedroom via smart storage solutions, like this black-and-white built-in cabinet. A cushioned headboard adds a touch of visual interest to this minimally designed bedroom. 6. Jalan Bahagia 3 Room by Oblique Interiors. This minimalist industrial bedroom features sparse furnishings and a varying mix of neutral tones. Sleek lines and a concrete headboard with built-in shelving keep the look more interesting. 7. Light Play by Meter Square Pte Ltd. This contemporary minimalist bedroom does not need a lot of furniture and furnishings to look welcoming. With its abundant display of sunlight, bay window seating, and a comfy all-white bed, it effortlessly functions as a sanctuary for its homeowners. 8. Minimalist Scandinavian Home in Dover Crescent. This minimalist bedroom highlights a wooden platform bed with hidden storage and built-in shelving whose functionality screams "Scandinavian". A grey feature wall provides contrast. 9. Minimalist Industrial Home in Yishun. Clutter and unnecessary home accessories are absent in this minimalist bedroom. To keep the area from looking too sterile, polka dots are featured on the bedroom wall, acting as a DIY headboard of sorts. Check locally designed minimalist spaces here. Check more photos of minimalist homes here. Share photos of your minimalist homes with us. Email us at hello@cromly.com.